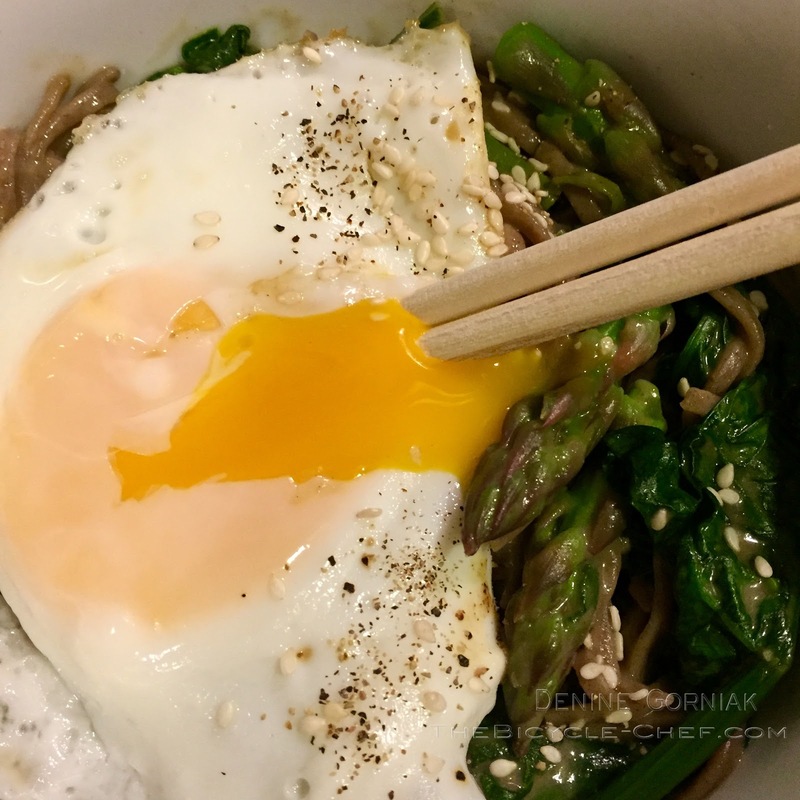 Asparagus, Spinach, Soba Noodles and a fried egg! Asparagus and Farmers' Market season is here in Collingswood. Taking some inspiration from my first shopping trip on opening day of our Market's 18th season, I bought my first farm-fresh asparagus from my buddy, Gus, of Viereck Farms, spinach from another vendor, and fresh eggs from Far Wind Farms. Looking to find a new way to enjoy asparagus, I found a recipe from Milk Street magazine, so I'm "borrowing" a recipe they had posted in a winter issue. I've changed it a bit here and there to make in my own and to use what I already had on hand. Herewith is a one-pot dish of soba noodles cooked with asparagus and spinach, served with a lightly fried egg and dressed with a soy and tahini sauce. Very easy to whip together and adapt as you need. The egg adds creaminess to the dish, and a bit of protein - don't dismiss it, it's truly delicious. You can also add in other veggies, cooking them before hand, or using them raw, I'm a big fan of tossing in shredded carrots or broccoli into the cooking water as the noodles cook. In a large microwave safe bowl or jar, whisk all ingredients, soy sauce through hot sauce together. Heat for 1 minute in a microwave and whisk in the tahini or nut butter to emulsify. If the sauce starts to clump or break, heat it again briefly and whisk again to blend thoroughly. Season with fresh ground pepper and more hot sauce to taste. Set aside, or if using later, place in a clean jar and refrigerate up to 2 weeks. Shake or whisk before using. Bring a large pot of water to boil, add salt to the pot once the water boils. While the water is coming to a boil, clean and cut the asparagus, snapping off the woody stem ends of the asparagus. The asparagus end should snap off easily at the point where the tough and tender ends meet. Cut the asparagus tips off and set aside. Take the stems and cut them in half length-wise, then cut into bite-sized pieces, about 1 1/2 inches long. Thoroughly wash and dry the spinach, being sure to remove all traces of sand and dirt. I recommend using a salad spinner and changing the water at least three times. Set the cleaned spinach aside. When the water comes to boil, add in the two tablespoons of kosher salt - the water will boil harder and faster now. Then add in the soba noodles and the asparagus stem pieces. Stir and bring the cooking water back to a full boil. Cook the noodles until they are tender, according to package directions, about 5 minutes. Right before draining the noodles, add in the asparagus tips. Drain everything into a large colander and reserve 1 cup of the cooking water. Don't shake out the water from the noodles and asparagus - you want some to cling to the noodles. Using the same stock pot from which you drained the noodles, add in the cleaned spinach and then add back the cooked soba noodles and asparagus. Toss to combine and wilt/cook the spinach. Add in half of the soy sauce-tahini mixture and toss to combine again. If the mixture is too thick, use some of the reserved cooking water to thin the sauce and to help further cook the spinach. In a small fry pan, fry up each egg, until the yolks are just set. You can fry the eggs in sesame oil to keep with the flavor profile. To serve, place some of the noodles and vegetables into a shallow bowl and top each with a fried egg. Garnish with sesame seeds and a few grinds of freshly ground black pepper. Season to taste with additional soy-tahini sauce. Break the egg yolk and mix into the noodle and veggie mix, creating an additional sauce to coat the noodles. Serves 4 and will keep 2-3 days refrigerated. Can be served hot, warm or cold.